You are currently browsing the archives for the Media Center/Media Player category. My God, shocking news coming from over the network… Windows Server fans, listen up and listen carefully. It’s not fully confirmed (duhh, because Microsoft hasn’t said anything about it yet) but here’s the shocking news – Windows Media Player 11 will only be available for Windows XP SP2 and Windows Vista… absolutely nothing for Windows Server 2003. Now I see that as kinda unfair to be honest – I use Windows XP MCE 2005 on my lappy, and Windows Server 2003 Enterprise R2 on my desktop beside me, because it’s a hell of a lot more stable than Windows XP. But knowing I can’t get Windows Media Player 11 on it *shocks* me… *shock* and disbelief. Actually I think we could probably forsee it from the start… and it’s not confirmed… but that’s just what I’m hearing from various sources. Waiting for an official feed from the Vista team, until then lets just hope that it’s untrue I tell thee, untrue! 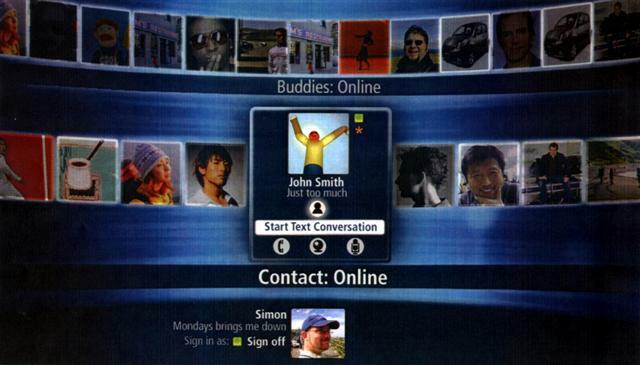 Codename Nemo is designed to be an add-on for Windows Vista (Home Premium and Vista Ultimate editions), that integrates Spaces, Messenger and Live Call into a UI designed for large monitors and TVs. Nemo essentially creates a Windows Live Media Center, and is optimized for use by Microsoft Media Center remote, as well as keyboard. Of particular note is the 3D Gallery view for browsing Windows Live Spaces, shown below, presumably built using the new Windows Presentation Foundation that will be included in Windows Vista. By bringing Windows Live to the living room, Microsoft could expose users to its online services in a way that competitors such as Google or Yahoo have not yet exploited. With content plus advertisers equaling revenue, this can only be a good thing for MSN. Adding MSN Soapbox or MSN Originals integration into this Windows Live package could present Microsoft with a content delivery method that really starts to move the PC out of the office. Combine this with live concert streaming thanks to MSNâ€™s recent partnership with Control Room, and suddenly the Media Center PC has much more to offer. Nemo would make upgrading to Vista a lot more attractive for the Windows Live fans too. Although initial indicators that Nemo would be in beta by the end of 2006, the project now appears to be on hold, for reasons unknown. We have heard it was demoed at MGX 2006, an internal-only Microsoft conference for those working in global sales and evangelism, so weâ€™re expecting (and hoping) to see it back on track soon. The BBC has signed an agreement with Microsoft to explore ways of developing its digital services. The non-exclusive memorandum of understanding sets out a framework for joint projects between the two organisations. Mr Thompson and Ashley Highfield, director of new media and technology at the BBC, met Microsoft chairman Bill Gates on Wednesday as part of a fact-finding tour in Seattle, US. They are also speaking to other companies, including Real Networks, IBM and the makers of the virtual world Second Life. A BBC spokeswoman said the memorandum of understanding was the beginning of a dialogue between Microsoft and the BBC. Potential areas of collaboration include search and navigation, distribution and “content enablement”. However, any procurement of new technology with the company would be subject to regulatory approval. Bill Gates said: “Microsoft’s strength is in driving digital innovation, and our vision is to open up rich, new consumer experiences that allow people to enjoy digital content anytime, anywhere and on any device.